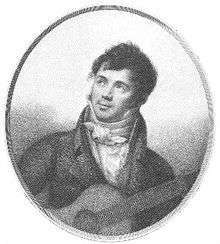 Fernando Sor o Josep Ferran Sorts i Muntades (baptized 14 February 1778 – died 10 July 1839) was a Spanish classical guitarist and composer. While he is best known for his guitar compositions, he also composed music for a wide range of genres, including opera, orchestra, string quartet, piano, voice, and ballet. His ballet score Cendrillon (Cinderella) received over one hundred performances. Sor's works for guitar range from pieces for beginning players to advanced players such as Variations on a Theme of Mozart. Sor's contemporaries considered him to be the best guitarist in the world, and his works for guitar have been widely played and reprinted since his death. Although modern classical guitar players usually do, Sor rarely used his ring finger and refused the usage of nails when playing. Having abandoned his family's ideal of a military or administrative post, Sor could finally give music a serious try in France. He gained renown at first as a virtuoso guitarist and composer for the instrument. When he attempted composing operas, however, he was rejected by the French. His Opus 7 was a large and strange piece, notated in three clefs, and no guitarist at the time could play it. Since France was no longer supportive of his music, Sor decided to try his talents elsewhere. In 1827, partly due to his advancing age, he settled down and decided to live out the rest of his life back in Paris. It was during this retirement that he composed the majority of his guitar works. He had to comply with the demands of the public, though, and most guitarists wanted technically simple, nice-sounding pieces. It was in these last ten or so years of his life that his writings reveal his bitterness towards how his publications were being received by the public. For example, Opus 43 is entitled Mes Ennuis ("My Annoyances"), and six of his ballets are dedicated to "whoever wants them". These and other caustic remarks did not help his sales in the least. The foreword to Opus 45 goes even further than sarcasm: "Let's see if that's that. Six short and easy pieces in stages, which aim to lead to what has generally been agreed are difficulties. 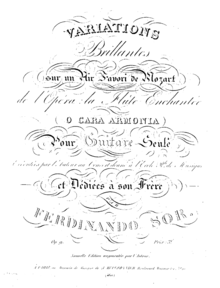 Composed and dedicated to the person with the least patience, by Fernando Sor. Opus 45." One of Sor's most popular compositions is his Introduction and Variations on a Theme by Mozart, Op. 9. It is based on a melody "Das klinget so herrlich, das klinget so schön!" from The Magic Flute, which Mozart composed in 1791. 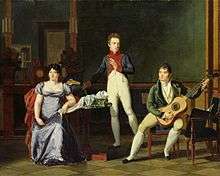 Wikimedia Commons has media related to Fernando Sor. The Doctrine of Affections: short story collection including "The Studies of Fernando Sor"
1 2 "Josep Ferran Sorts i Muntades". Enciclopèdia Catalana. ↑ Tracie Ratiner, ed. (2005). Encyclopedia of World Biography. 25 (2nd ed.). Detroit: Gale. pp. 394–396. ↑ Sor, Fernando. Merrick, A., ed. Method for the Spanish Guitar. New York: Da Capo Press. ↑ Carme Morell i Montadi (1995). El teatre de Serafí Pitarra. L'Abadia de Montserrat. ↑ Baltasar Saldoni (1856). Reseña histórica de la escolanía ó colegio de música de la Vírgen de Montserrát. Imprenta de Repullés. ↑ F. J. Fétis (1810). Revue musicale. ↑ Recensionen: Guitarre-Schule von Ferdinand Sor. Breitkopf und Härtel. 1810. ↑ Wolf Moser, “Fernando Sor: The Life and Works of a Reluctant Guitarist, part one” from Classical Guitar Magazine, November 2007. ↑ Matanya Ophee: "Fernando Sor and the Russians", in: Soundboard Magazine. ↑ Wolf Moser: "Fernando Sor: The Life and Works of a Reluctant Guitarist", part 2, in: Classical Guitar Magazine, December 2007. ↑ "Leonhard Schulz: Recollections of Ireland Op. 41". Guitar And Lute Issues. ↑ "Fernando Sor – Master Composer for Guitar?" (PDF). Lawrence Johnson. ↑ Neue Mozart-Ausgabe. "Mozart: Die Zauberflöte (Partita – see p. 157; bar 301 – Monostatos und Sklaven...)". ↑ Fernando Sor. 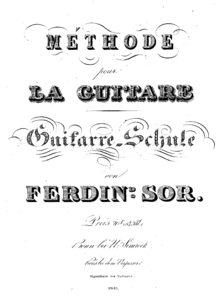 "Méthode pour la Guitare". Tecla. ↑ Innovation and the Development of the Modern Six-String Guitar by Darryl Martin (The Galpin Society Journal, vol. 51 (Jul. 1998).